Let's start this off with a recent review from a wearer of these boots, shall we? "We just got these boots in our volunteer department. Although we would have preferred leather boots, our budget is way too tight. So our chief bought us these boots. They are surprisingly nice for rubber boots. Lighter and more comfortable than other boots. A nice change from all the other brands we have tried over the years." The new Cosmas 13" Java Bunker Boot prides itself on combining the protective qualities of a structural firefighting boot with the comfortable feel of a regular shoe. They designed it to fit just like a regular shoe, with minimal heal slippage when you're running or walking-because who has time for that when on the scene? The Java Bunker Boot is handmade from 100% vulcanized waterproof rubber. 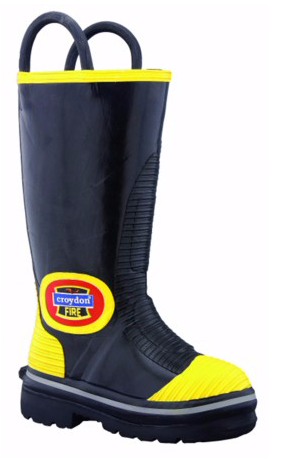 The boot features a high visibility yellow trim with 3M reflective piping around the outsole for awesome visibility. The Nomex lining provides extra insulation and safety. With the vulcanized pull-on loops you're able to easily get those boots on and off with no fuss at all. If you want to reduce foot, leg and back fatigue that comes along with long days on your feet, the boot's 100% polyurethane insole helps that. You can rest assured that with the protective midsole features and ASTM and CSA certified puncture resistant steel plate as well as ladder shank you will be climbing ladders in comfort with support you need. Your lug outsole is non-slip, abrasion resistant, self-cleaning and resistant to hydrocarbons. The steel toe cap will protect those toes from puncturing hazards that may try to come your way. The boots come with a great warranty. So if you're looking for an awesome pair of pull-on's--let the New Cosmas 13" Java's be your pick.